Okay, okay, I’ll wash them again! That’s Señor Calcentín on top, he’s such a show-off! I know, I know, I did it again. 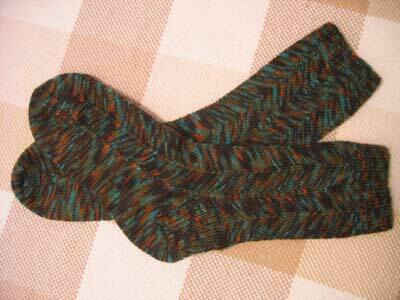 I just couldn’t stop myself from putting the socks on, even after I washed and blocked them! I’m not mailing them out until September, so there will be plenty of opportunities to wash them one more time. Time to complete: There was frogging, and lots of it. ‘Nuff said. looking good! looking very good! Just don’t start wearing them around. I don’t want to see those socks on the streets of Cambridge, ya know. i love them! i’m about to start a pair of socks, maybe i’ll wait for your pattern! they are beautiful! WTG, I just know your pal will love them! You rock for making the pattern avail. to us – I’ve been admiring your attempts on these since you began, saying, damn, I hope she shares the pattern. They are lovely. Nice. A very original look. Awesome! They turned out great. Thanks for making the pattern available – I definitely want to try it out. I can’t believe you are done! They look fabulous…thank you…I will love them…if they are mine! Fabulous sock pattern. I love them! I love those socks! I can’t wait to see your posted pattern and to hear about how much your pal loves them when they are sent out for the exchange. They are so great! I can’t wait to make them myself! They look great! I’m glad you’ll be posting the pattern! You’re so talented! Awesome! You’re going to have them worn out by September if you keep this up. And you don’t even wear wool. Are you sure those socks aren’t really meant for yourself — you seem to have bounded nicely with them! Don’t hand knit socks just feel great to wear? Once you put them on, it’s hard to take them off. 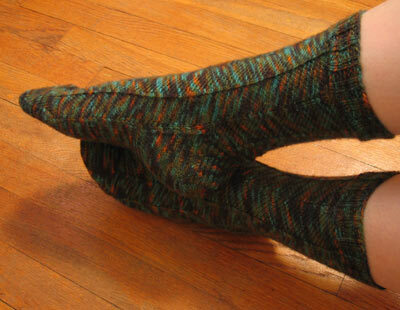 Size 1 needles–what a lucky recipient of these socks! Not only does YOUR PATTERN capitalize on the handpainted yarn w/o pooling, it enhances your stitch pattern. You’ve done it again! Your socks look amazing. I think you completed them very quickly! Your sock pal should be very happy. Any chance that’ll be ME!!!??? they really do look lovely!!! I can’t help but wonder how you know which sock is Señor Calcentín and which one is Mr. Sock.. How do you tell the difference? Do you just know like the mom of twins? Fabulous. Enough said! Oh how I wish I was your secret pal. Maybe next time. Those are wonderful, I love the pattern also! Lucky sock pal! These are wonderful socks, and all the better for the hard work you put into them. I’m amazed at your perseverence and can’t wait for the pattern. I absolutely love the color palette! I think half the fun of being a sock pal is seeing what everyone else is getting. Your socks are divine!!! Will you make the pattern available to non-Sock-along knitters? I’d love to have the pattern….and the yarn! Where did you get #11 handpainted Opal? I thought I had the Opal market covered. Knit on!